Since the final distribution your farmers have been thinking about this year’s growing season. In a nutshell, the 2015 season was a very good year in an average sort of way. It was a “typical” year for the farm, in the best sense of the word. The shares were diverse, abundant, and reflected past suggestions from CSA members. 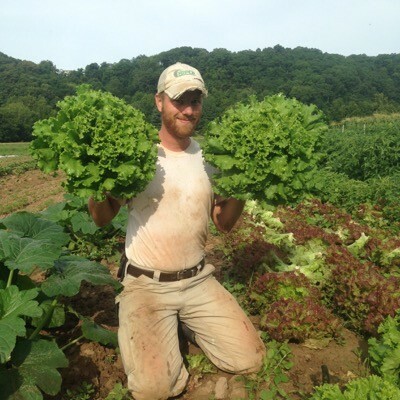 Your farmers were very pleased with the harvests, which amounted to just under 40,000lbs of fantastic produce. And that’s pretty neat! However, the 2015 season was not without its challenges. We endured through three dry spells, and the growth of weeds proved to be a struggle in the Spring. The dry month of May was especially difficult, but we managed to keep our plants watered through careful and continuous rotation of our irrigation line. This extra labor ensured our young crops’ survival and we counted our blessings in the form of a reliable irrigation system. We were also happy to continue working alongside Craig and the rest of the crew at the Schneiderwind Farm and Nursery. We have continued to enjoy our time here on this special property by the Delaware River. We were also fortunate to have help from willing volunteers, and we are so grateful for the opportunity to work with pleasant folks who enjoy being in the fields with us. 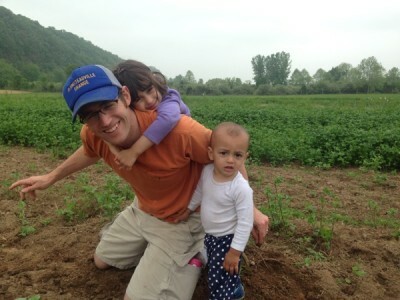 Farmer John’s brother, and niece & nephew were especially enthusiastic volunteers. Some crop highlights included consistent lettuce and great garlic. 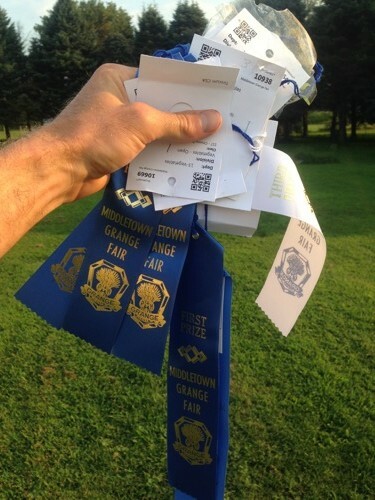 We entered two of our lettuce varieties at the Middletown Grange Fair and won first prize. Our lettuce has won for the last three years in a row so you can be proud that you eat award-winning lettuce. One of our goals this year was to improve our garlic production, and we did just that by planting from new seed and using hay mulch. It is exciting to see how well a crop can do when we focus on that crop, and our garlic was a shining example in 2015. This year we calculated the average crop yield per bed. For stats fans out there, like Farmer Stefan, this was an interesting exercise. Unsurprisingly, tomatoes yielded the most per bed at 646lbs per bed. The most unexpected result was that jalapeño peppers ranked 2nd, yielding 488lbs per bed. Frankly, it’s kind of bizarre that jalapeño peppers would out-perform melons and winter squash, but upon reflection, Farmer John vividly remembers hauling a very full pick-bag out of the pepper patch for many weeks on end. We welcomed a 20% increase in our membership this year, reaching 122.5 shares sold. We attribute our success in gaining members to a few old and new marketing strategies including our Every Door Direct Mail Postcard and a shiny brochure. Also, positive word of mouth has helped us to reach more people nearby, so we are thankful to all of our members for talking us up. Whether you share a share with a neighbor, or you invite a friend over for dinner and feed them veggies from Tinicum CSA, it all goes a long way in demonstrating the tangible, tasty benefits of being a member of our farm. As we strive to grow our crops sustainably we are also mindful of financial sustainability. We are encouraged by this year’s increase in membership and are hopeful about growing the membership over the next several years. Specifically, we envision increasing the membership by about 20 each year for the next six years in order to reach a membership of 240. Since the farm’s inception this has been our goal, and with your continued support, we feel confident that we can reach it. 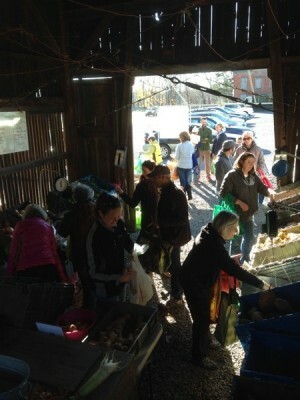 On a final note, we are thankful for the community spirit of Tinicum CSA. It’s one thing to grow and harvest fantastic produce, but we enjoy an entirely greater sense of satisfaction in distributing it to our members. We feel privileged to get to know all of you and it’s especially fun to notice how so many of our members talk to each other. We’ve heard first hand from some that coming to the farm provides a special time to meet up with friends and family. Thank you all for your support this year and we look forward to growing for you next season.